I can speak authoritatively on Jamaican food since, not only do I eat it, I also prepare a few of the dishes myself :-) Thanks to my belated grandmother "Mammy" - an expert chef, mother and disciplinarian. Our food is truly a celebration of the diverse cultures we boast - but with a touch of novelty and innovation. The Arawaks [or Tainos] - the island's earliest recorded inhabitants, contributed the famous 'Jerk' idea. I learnt also that it was the English - who captured the island from the Spanish, that brought the concept of patties to the island. 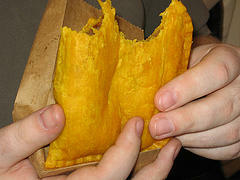 Today, Jamaican Patties are now a world favourite! The Indian influence is dominant in our curry dishes. Today, we not only have curry meats, but curried vegetables and fruits! The annual Westmoreland Curry Festival provides a wide array of appealing curry dishes. And the creativity expands every year! Incidentally, my former high school - Manning's High, is host of this yearly landmark event. 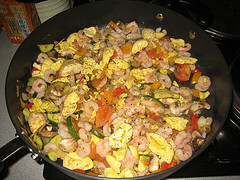 The following are some of the most popular and may I dear say, favourite, Jamaican dishes. 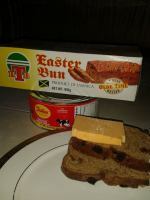 I have not yet met a fellow Jamaican who does not relish this dish. Its versatility allows it to be served with almost any dish. 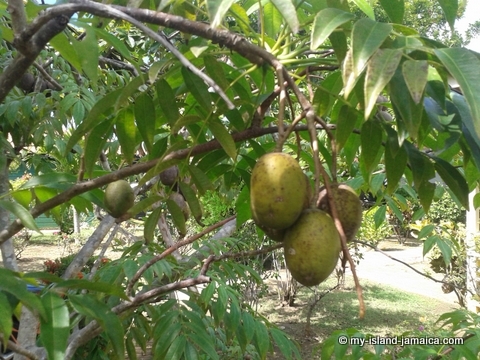 My family serves it up mainly with roasted breadfruit or boiled bananas. It is a Sunday morning breakfast favorite! Ask any Jamaican what is their favourite, easy prep, poor man's dish and they'll likely tell you that it is curried chicken (or curried chicken back) and dumpling! Before I changed my diet up a bit, curried chicken and dumpling was my personal favourite! Curried goat, aka curried mutton, is not not only popular but a delicacy here as well. The ram goat (male) is the preferred option though. Currried Goat is a must-have on the dinner table at Christmas time. 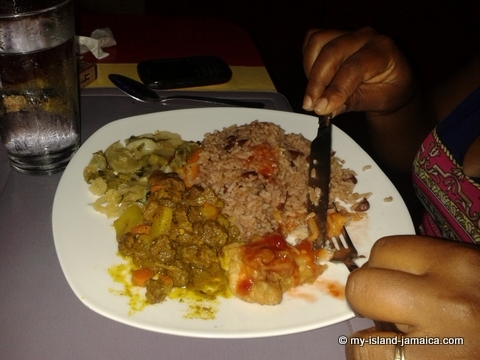 By the way, below is a pic of my wife having curried goat with 'rice and peas', fish and some steamed vegetables back in Negril. 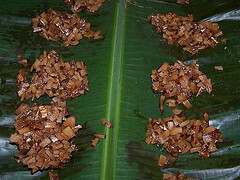 Manish water is also known as 'power water' and 'goat belly soup'. This is a must at funerals, weddings, wakes, and indeed any large gathering, including traditional dance parties. With pigs' tail or beef, the option is yours. Get is home prep and you'll keep asking for more. Another breakfast favourite. 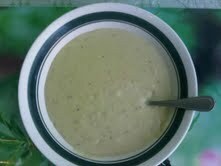 There cannot be much meals as tasty as the custard from the boiled coconut juice in this meal. The Jerk Dishes -Jerk Chicken, Jerk Fish, Jerk Pork, etc. 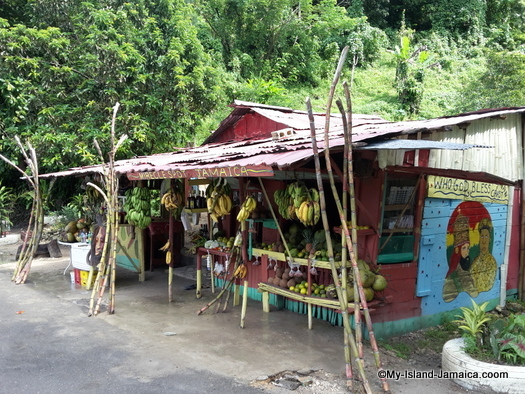 One of the 'brand' food from Jamaica, Jerk dishes can be had at any of the top hotels we have and even on the roadside - if you prefer that, courtesy of the 'Drum Pan' chefs. 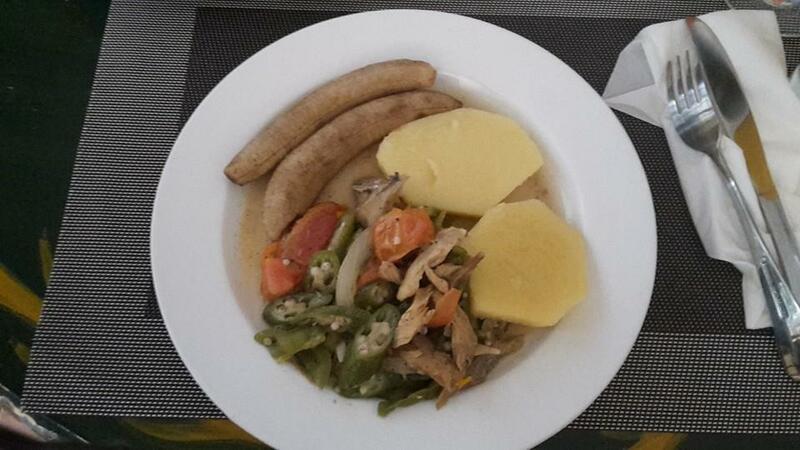 Jamaican Jerk is an international favourite. Of course by now you know that it is pimento, aka Jamaican allspice, that is the core ingredient in our jerk preparations. 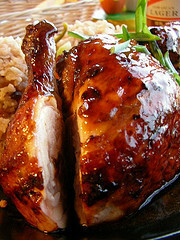 Be sure to also see our recipe on how to make Jamaican jerk marinade. Yes, that's actually the name of the dish! It is possibly the most popular dish here. 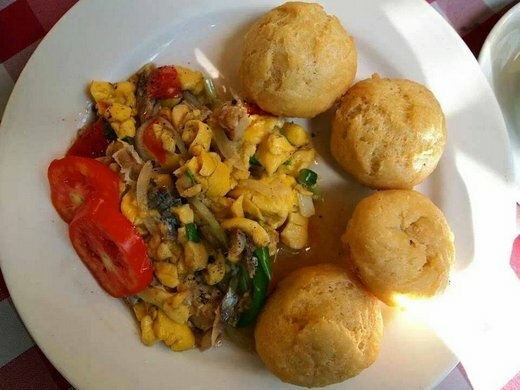 In the past, rice and peas was eaten mostly on Sundays, but today, this is one of the first menu item you'll likely get at any local restaurant, cook shop or eatery. The men love it! Argued that it is good for stamina, we have it mostly curried, but more recently we are having it.... you guessed it, JERK! Jamaican Jerked Conch with vegetables and baked potato. Patties Now famous the world over! By the way, can I tell you that I now owe my US based co-worker Rukhsana, over 100 patties! If not a breakfast item, festivals are usually a side item to the main dishes, I love them unending! They are usually served with our jerk dishes, from jerk pork to jerk chicken. Either on provides a solid start to the day. Today we have lots of cart vendors who sells porridge in the cities in the mornings. Strapped for time or running late? Fried plantains to the rescue. 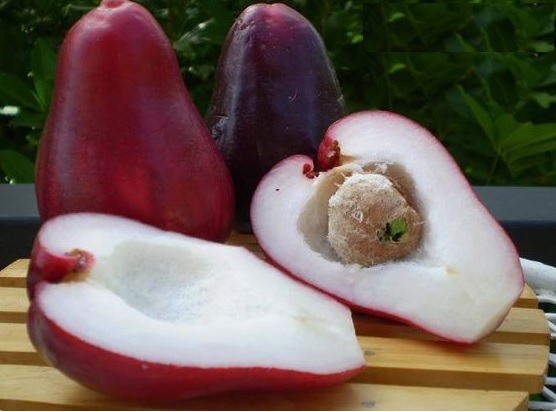 They are quick to prepare and has lots of nutritional benefits too. New! 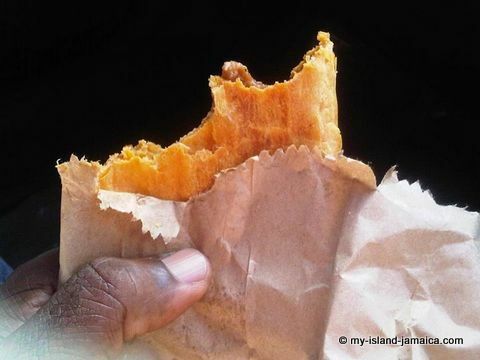 Have you seen the pictures of Jamaican food? Make sure you don't miss them. Visit this page and delight your taste- buds! All pictures! But we have even more. 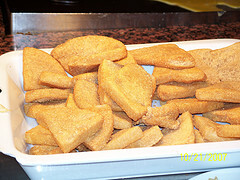 Get the extensive of Jamaican desserts here. Most popular at Christmas time. These have become increasingly popular. They are believed to help with masculinity and male sexuality. I had one brand which had no less than 15 different roots ingredient! Sangster's Rum Cream liqueur, a favourite the world over! Coconut Water: Cool and refreshing! 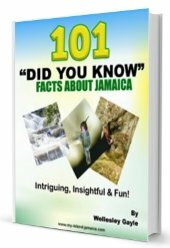 Coffee: How could I forget (I almost did) the authentic Jamaican coffee? Jamaica's Blue Mountain Coffee is world premium by every test! And of course, Jamaican wines & Jamaican Rums, which includes the world famous Appleton Jamaica Rum. 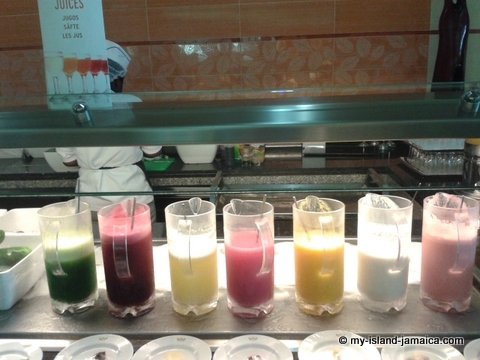 Learn more about drinks on my Jamaican Drinks page and feel free to try some of them that are on the Jamaican drink recipes page. My family has loads of trees around the old family house in the country. Despite the stain it can emanates, I can't get enough of it. 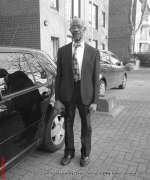 I look forward to the season, usually in March / April, when Opal (a friend of mine) and I go to Bickersteth (St. James) to fill up the crates! 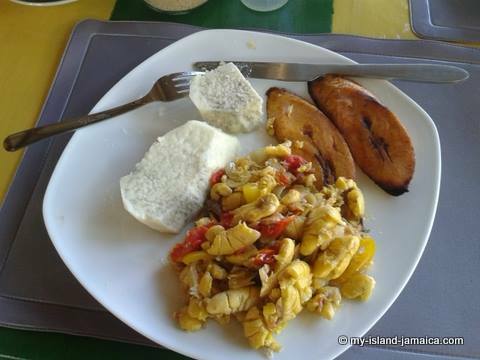 By the way, we also have the tasty and versatile ackee, and breadfruit, but we have those cooked. 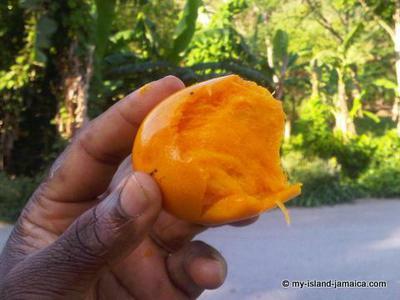 Read more on Jamaican fruits here. So you see, the list is quite lengthy, and this is just the beginning, pulled from direct memory. Although these would certainly represent the most popular or favourite, I will continue to update as we go along.